Rather than fighting for parking at the mall this year, consider going local online instead! Etsy is a treasure trove for great deals, thoughtful gifts and most importantly, all of the heartfelt homemade goodness that you won't ever be able to find at a big box retail store. So pour yourself a cup of tea, put up your feet and starting crossing items off your Christmas list, 'cause we have a feeling that you'll find just as much to love as we did. Happy Holidays, from everyone here at ParentMap! Going local offline? If you must brave the traffic and the crowds, check out our extensive online directory for plenty of local businesses that offer fantastic children's gifts -- and that are well worth all of the holiday madness! We love Cherylasmith's fabulous felt finger puppets! For only $20, you can select a set of five of your favorite puppets from over 50 puppet characters -- including fuzzy animals, aliens, dinosaurs, ladybugs and so much more! Great for all ages, these puppets are stitched by hand and arrive in individual packages. And since the puppets are made to order, Cherylasmith notes that color preferences are available. Overall, a great stocking stuffer idea for both boys and girls! You might also like: If you've got a little Star Wars fan at home, consider checking out Littlefox71's set of nine Star Wars felt finger puppets... so clever and all of the main characters are included! Rabbit! Rabbit! Softies' baby snoozies are a must-have this year for the little bunny snuggler in your home. Made with cotton fabric and wool felt, these DIY adorable snuggly bunnies range in price from $18-23 and are all made one-of-a-kind. Rabbit! Rabbit! as well carries a wide variety of must-have cuddly lions, rabbits and bandits for your older snugglers. Baby, it's cold outside! Everett-based Sophie Marie's car seat covers will make the perfect gift for the new mama in your life that is always on the go with her favorite sidekick. Priced at $50, these car seat snuggies are made from two layers of ultra-soft fleece and they are available in a wide variety of colors and patterns for both boys and girls. The cover acts as a blanket without blocking baby's seat straps or movement and they are simple to wash with cold water and a good hang dry. And as an added bonus, Sophie Marie will be donating 10 percent of the shop's proceeds to the local organization WestSide Baby, available now through Christmas! One of our favorite toys growing up was a homemade catapult and we could not resist sharing Things 'n Stuff's wooden catapults! Priced at $40 apiece, these catapults are made from salvaged poplar, cherry or birch wood and are rubbed with a mixture of beeswax and mineral oil to ensure safe use for children. The catapults feature two different pegs for adjustable tension and they come complete with a muslin bag packed with three rubber bands and ping pong balls to get you started. Perfect for knocking down towers, catapulting marshmallows or strengthening your child's coordination, these wooden catapults are sure to be a total hit this holiday! LittlePicklepotamus' felt veggies will certainly add a healthy touch to your child's next playtime feast. As shown, the homemade felt set of five ($45) features a tomato, carrots, asparagus, Brussels sprouts and a beautifully textured corn on the cob. LittlePicklepotamus notes that all of her felt products are made with Eco-Fi polyester felt, polyfill and hand stitching -- with no glue included. We would also recommend checking out the rest of LittlePicklepotamus' inventory of felt food -- pretty much any meal or treat that you can think of is included and beautifully handcrafted! SmoochyBabyDesign's flower sorting tower is perfect for the toddler in your home that loves sorting, stacking and making structures. Priced at $49, these flowering towers are made from sanded, silky smooth sustainable walnut and poplar wood and come with an organic bag for easy toy storage. Each tower is made to order, so you always know that you're getting a one-of-a-kind gift. SmoochyBabyDesign as well offers a variety of wooden cars, animals, walking toys and more -- all of which are priced under $50 and made from eco-friendly natural wood. Bynichole's stuffed puppies are a great gift for the youngest animal lover in your home that may be hoping for a new best friend this year. Featured in chocolate brown and golden colors, the stuffed pups ($16) are made from soft fleece and sit 15 inches high from head to bottom. The pup's eyes are secured safely so that you will not have to worry about any potential choking hazards and you can choose between brown, blue or green for the eye colors. Durably made, this pup is soft and snuggly for plenty of hugs and day to day adventures! We cannot get enough of Those Greathouse Women's homemade I Spy games -- so clever! Ranging in price from $8-36, these I Spy games come in various shapes, characters and colors, including a toy robot, a flying saucer, a stegosaurus (as shown - $24), a school bus and so much more. There is even an ice cream cone I Spy bag! Every Those Greathouse Women I Spy bag comes with up to 27 hidden trinkets for finding and a handsewn patch on the back that lists all of the treasures hidden inside. The Bitsy Bean's natural wood baby teethers make an excellent gift or stocking stuffer for the little ones in your life that are beginning to chew and bite... on everything! 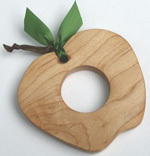 Priced at $14-15, these natural teethers are made with maple or cherry wood and are sanded to be satin smooth for baby's mouth and grasping hands. Parents can opt to have a beeswax finish or leave the teether unfinished for no additional cost (both are equally safe and non-toxic). The Bitsy Bean also offers various shapes to choose from, such as the apple shown on the left, a pear, keys, a whale and even an adorable wooden cell phone! We love Blynken & Nod's playground scavenger hunt cards... so cool! For $19.50 you can purchase one pack of these cards or you can get three packs for the price of only $45 -- with plenty of outside fun included! 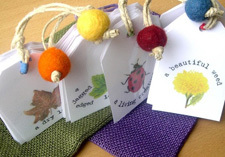 The cards come with a colorful, muslin drawstring bag for storage and feature objects that are typically found in a backyard on the playground or in the nearby park. Overall, an excellent stocking stuffer for the avid outdoor explorers in your home! Got a young puzzler on your hands? Entwood Crafts carries many wooden puzzles of various animal and mythical creatures, such as the Pegasus puzzle shown on the left. The puzzles are made with all-natural woods and typically only have between 5-15 pieces -- making them easy for young minds to solve. Entwood Crafts does recommend checking on the puzzles to ensure that they do not contain smaller pieces if they are being purchased for younger children; puzzles range between $10-55, depending on their size. Sweetie Pie Tutus has a great -- and vast! 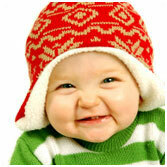 -- selection of tutus for all ages, from newborn to adults (that's right, mama!). Ranging from $17-60 for an entire ensemble, Sweetie Pie's tutus are absolutely adorable... not to mention that they come in almost any color that you could possibly think of! Many of the tutus come with a free coordinating headband and bow, and coordinating onesies or 'super sweet' fairy wings are also available upon request. So if you've got a fairy princess that is in need of a new snazzy outfit this year, consider checking out the many colors and sizes that Sweetie Pie Tutus has to offer! ZeeBree has a great selection of recycled crayons in various shapes, such as cupcakes (shown on the left), firetrucks, robots, stars, alphabet letters and much more. We think these cupcakes are a great idea for stocking stuffers and the fact that they're recycled crayons in neat shapes? Well, that just seals the deal. The crayons range from a jumbo-sized single, scented (!) cupcake for $2.50-24 for a party set. Custom packaging is available as well upon request. Knitting Momma's branch walking blocks are so lovely! We remember having a set that was similar and trekking all over the house for hours in our 'clompers' (as we called them). Knitting Momma's handmade branch walking blocks are made from birch branches ($16) that are selectively cut in northern Vermont. These walking blocks will help your young 'clompers' with their gross motor skills and they'll also be a whole lot of tall-walking fun! We love Sasa Orginals' plush animal rattles! Priced between $18-21, these baby rattles are available as owls, giraffes, elephants and dinosaurs. All of the rattles are made with linen and 100 percent cotton fabric. Plus, they are all made with beautiful mix-and-matched patterns and colors, making them equally interesting! The owls stand at 11 inches tall and seven inches wide; check the Sasa Originals shop page for more information and sizes on the other animal rattles. Super hero, to the rescue! Preschooler by day... and a superhero by night? If this sounds like your child, consider letting Santa know that they may want a much-needed personalized mask and cape this year under the tree. SDK Designs' capes range from $24-26, depending on if you'd like to add a mask to the overall disguise. The capes fit ages 2-7 and can be personalized with an initial or a powerful symbol that best represents your crime-fighting young one. Each disguise is made with a cotton/poly blend fabric and a Velcro neckband for easy adjustment. Henry and Zoe's zoom car bucket gift set is a fantastic choice for the tots that love everything race cars. Priced at $56-62 for a personalized tote bag, these car buckets include a play mat and car pouch made from a soft flannel with a Velcro closure so that little hands can easily roll it all up when they are finished racing for the day. Plus, the play mat can double as a nap mat or blanket when your little one is in need of a quick fix! Henry and Zoe as well offer winter fun buckets, doll backpacks and even a cookie baking bucket with recipes, a child-sized apron and a chef's hat. So cool! We love Clear Hills Honey Company's idea for these all-natural bath crayons! Priced at $8 for a set of four, these crayons are made with pure Castile soap and non-toxic pigments -- unlike many store-bought bath crayons that contain harmful lead and mercury. Each set of these cute and colorful crayons comes complete with a fun 'eraser' sponge for easy clean up after your little artist has finished with their bath time fun... that is, if you can ever get them out! We can't get enough of Wee Waldorf's colorful wooden Skittles set! Priced at $49.95, each set of this classic game includes ten wooden pins and one wooden ball, all detailed with the white-washed, non-toxic colors of your choice. Wee Waldorf's Skittle set also features an acorn pouch that is large enough to hold the ball and all of the pins when they are not being used. Who needs to wait at the bowling alley, anyway? Home bowling is much, much cooler!